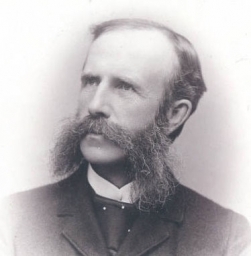 Ezra Brainerd, who became Middlebury's eighth president in 1885, is among those profiled at Middlebury History Online. MIDDLEBURY, Vt. — Chipman. Brainerd. Storrs. Atwater. Painter. Warner. Twilight. Names from Middlebury’s distant past, they all come to life in a new digital archive hosted by the college’s library, called Middlebury History Online. Middlebury History Online (MHO), which was launched last summer, was first proposed in fall 2005 by Judith Tichenor Fulkerson, from the Middlebury College Class of 1956. She hoped to see the college create a digital archive from the many documents related to the history of Middlebury, beginning with its founding in 1800 through the early 20th century, that are found in the college’s Special Collections. The documents include manuscript letters, journals, diaries and archival records, as well as books, journals, other published works, and photographic images that directly relate to the College’s founders, faculty, students, alumni, and its relationships with the town and the state. Fulkerson, an alum and former member of Middlebury’s board of trustees, had a special interest in this project even beyond her other ties to the college: Isaac Tichenor, the governor of Vermont who granted and signed the original Middlebury College charter in 1800, was an ancestor. Fulkerson made a donation to the college to establish the archive, her 50th reunion gift to Middlebury. MHO, a collaboration involving the staff of Library & Information Services (LIS) and the Communications Office, remains a work in progress. As digitized archival materials are created, this online archive will continue to grow. We’d love to know what you think about this digital resource. Please contact us by writing to Rebekah Irwin, head of collections and digital initiatives for LIS, at rirwin@middlebury.edu.